We believe that yoga mats should be lightweight, compact, and easy to bring with you anywhere. That's why we designed the YogoMat. Yoga improves the health of your body and mind - and we want to make it easier to be healthy. The YogoMat is a lightweight yoga mat that's the size of a folded newspaper when folded and secured, but a full-size mat when unfolded. It only weighs 2 pounds, is 25% the size of a regular rolled mat when folded, and is small enough to fit in bags, purses and suitcases. 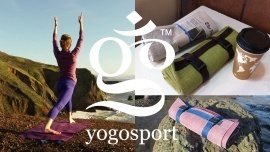 It's the featured design of YogoSport, and our company's namesake. Does your yoga mat fit in your purse? The YogoMat features a unique, patented strap design that allows you to rinse and hang it to dry when you're done practicing. No more worries about mold or bacterial growth on your mat - it will be dry by the time you want to use it again! After founder Ryon Lane broke his neck in an accident in 2008, yoga helped him grow stronger and run again. Yoga is now also used to help treat people living with paralysis. YogoSport is passionately committed to supporting the spinal cord injury (SCI) to community by working with organizations like the Christopher and Dana Reeve Foundation, which funds research that will one day find a cure for spinal cord injuries, and NextStep Fitness, which uses yoga to improve the quality of life of people who live with paralysis. We would love your feedback and thoughts!